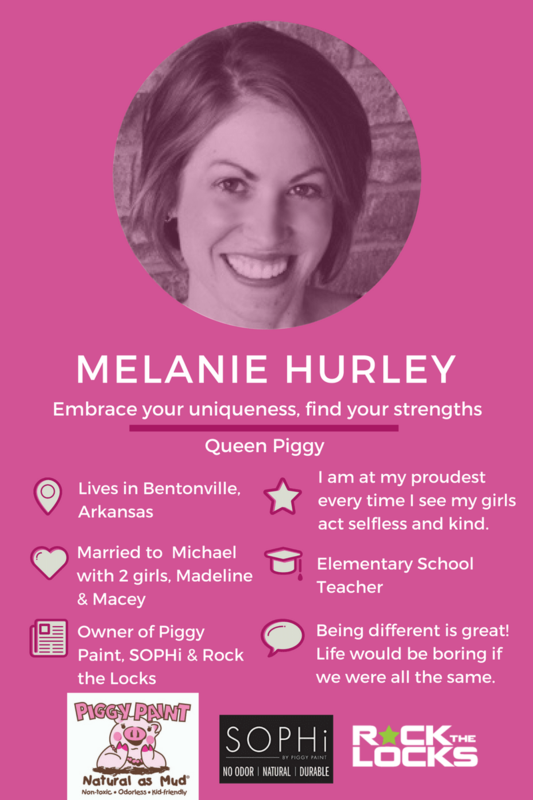 Melanie Hurley is the first Mom Inventor we’ve interviewed who is nearly a decade down the track with her invention, Piggy Paint, a Natural, Non-Toxic, Odorless, Eco-friendly Nail Polish for kids. 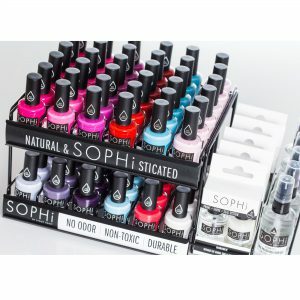 She’s had such success with her first company that she recently started up two new sister companies, SOPHi Nail Polish and Rock the Locks. Despite how busy she must be with 2 daughters and 3 companies, I found Melanie to be as natural and down-to-earth as her “natural as mud” products. My girls were 2 and 4 when I started. That was in 2008. They are 11 and 13 now. At the time I was staying at home, I was kind of looking for something to do. I watched an Oprah show about the lady who invented Jibbitz and her story about how it grew and I thought, wow, that would be cool. And I had thought of a couple of ideas before Piggy Paint but nothing seemed worthwhile to really go for it. And then once when I was painting my little girl’s nails over a Styrofoam plate, the polish dropped on, it bubbled, ate through it and it just got me concerned about the chemicals I was using on them. My oldest had a lot of allergies, asthma, I was always concerned about anything I put on her body because she would get rashes or hives or turn red, and so I had to be extra careful. And the smell of nail polish would give me headaches even with the fan on or the window open. So I had that kind of AHA moment and started looking for a natural nail polish and at the time I couldn’t find anything. So I thought, “oh wow, if I’m looking for it, then other people must be too” and that’s kind of where it started. I thought “well, I don’t have any business experience but I do know that I’m a Mom and I feel like I’m a pretty average Mom. I could be a good representation of other Moms in the world, so I’ll just model everything after what my children would want and what I would want to purchase as a consumer” and that’s really what I did. It felt like God was opening up doors every step along the way and so… it was a scary decision, but first of all my husband was on board. He’s a park ranger and I was a teacher so we had saved one of our salaries for 3 years so that I could stay at home when our girls were little. We kind of invested our nest egg into the business, so I knew that if my husband was good with it, as frugal as he was too, that it seemed like the thing to do. That’s amazing. That’s an incredible story, I love it. Would you like to share any highs or lows in your career as a Mompreneur? The fact that everything she filled out went something like, My Mom at the computer, My Mom at work. My Mom loves Piggy Paint. It just broke my heart because the reason I started Piggy Paint was for my children. I sat in my car and cried. I sacrificed a lot of time with my girls to grow Piggy Paint. I look at my children and we have all these conversations as they’re growing and I just see them becoming independent and intelligent and bold. When I read my Mother’s Day card this year, it’s so different. I love how they’re proud of their Mom for what I’ve accomplished. They’re old enough to understand it at this point and that makes me really proud of the fact that they’re doing great themselves and I’m able to be involved with everything in their lives. That makes me proud I guess, to be able to find the balance I tried for so long to achieve. Interestingly though, it may not have been negative to her when your daughter wrote all those answers down. You might have seen it as negative, she might just have seen your passion and thought I love my Mom and she’s just so passionate about Piggy Paint, that’s her thing. How did you manage to free up your time? By getting a business partner, by growing and having the right people on my team it’s enabled me to find a balance. Because really, it doesn’t matter how small or how big you are, or even how much help you have, it’s really a mindset because the work is never ending. I could work 24 hours a day still if I chose to but I got to a point where I had to figure out my priorities and stick to those. It was hard and it took a long time to get there but my girls and my husband are my no. 1 priority so it’s more of being sure to put them first and including them in the process. I’ve just come back from a show in New York, Toy fair, and my girls got to go with me and I took my husband and my parents and they all helped me in the booth and got to enjoy New York. As my girls get older they end up in the Summer at work with me a lot and they have a lot of fun helping and playing in the warehouse, lots of things. As they’ve gotten older it’s been nice to incorporate them in it too and not let it consume me. I think that’s the change. I have more time because I haven’t let it consume me like it used to. Yeah, you’re doing everything, you’re talking to people on the phone, you’re putting in the orders, you’re fulfilling them, you’re packing them, shipping them, answering customer service, you’re doing everything yourself. And then you get bogged down in every single detail. Whereas right now I trust people to execute and I don’t have that burden on myself. I’m amazed at how you turned it into 3 businesses… those hair products look amazing. Thanks! I’m excited about it. I think that once you’re an entrepreneur, it’s kind of in your blood and I think we’re all a little crazy. You can’t ever just stop. That’s what I tell my girls. You develop one thing and it works, you have to continually come up with new products, whether it’s nail polish, new shades or new gift sets but you have to continually evolve beyond that because everybody always wants what’s new. When did you start your 2 new brands? 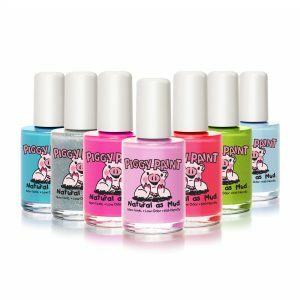 We had a lot of Moms using Piggy Paints on themselves, especially Moms who had little kids and didn’t like the nail polish around their little ones or pregnant Moms. So we had a lot of Moms using it and we had a lot of them saying, hey, I love using Piggy Paints but these colors are kinda crazy. Do you have any more sophisticated shades? So that’s where the name SOPHi came from. It came to me in the shower one day, they keep asking me for sophisticated colors, so we pulled SOPHi out of that and it’s been a year for SOPHi, and Rock the Locks is really new – this year. What do you see as the strengths and weaknesses of your business? The biggest strength of Piggy Paint is that the product sells itself when people find out it’s a safe, non-toxic alternative. The biggest challenge has been to convey those strengths on the packaging so people “get it” at first glance. Piggy Paint looks like any other nail polish in the bottle but is so much more. Another obstacle has been the higher price point, but once consumers understand the difference, they are usually willing to pay more for an eco-friendly product made in the USA. A thought struck me … you mentioned that Piggy Paints looks like any other nail polish but it isn’t and an idea came to me… what if the bottle didn’t look like a normal nail polish but looked completely different? You could make the shape of the bottle into little piggy’s or little characters similar to the Jean Paul Gaultier perfume bottles. Then the products would already differentiate itself by their look on the shelves. Yeah, great idea. We always have to use shelf talkers to call out the attributes. Good Point. I like it. It warms my heart to have Moms email or come up to me at shows and tell me how much they love Piggy Paint. We’ve had so many Moms thrilled to be able to paint their daughter’s nails for the first time without worrying about harsh chemicals. Little girls love to have their nails painted like Mom, and it can be such a fun, bonding experience. Moms have also used Piggy Paint on their newborn twins to tell them apart, and we’ve had ladies that are allergic to traditional polish and be able to wear nail polish for the first time (evening on their wedding day). My favorite is to be able to give Piggy Paint to children with illness or cancer that are forced to avoid chemical-laden products. It’s these stories that make it worthwhile. At the beginning when I started Piggy Paint, I really wanted Piggy Paint to be featured in Parents Magazine. It’s still a popular publication in the US but you know, magazines are not as prevalent as they used to be. But at that time every new parent at the hospital received a subscription to Parents Magazine. It was something I read cover to cover, it was something my friends read, it was something before you had all the social media and all the blogs to give you advice, that’s kind of what you turned to. So I really wanted to be in it. So that was a big highlight, in the beginning. It happened in the first year and I still have that framed on my wall because it’s a neat reminder that I achieved what I initially set out to achieve. Of course, my goals have gone beyond that at this point, but it was a big moment at the time. 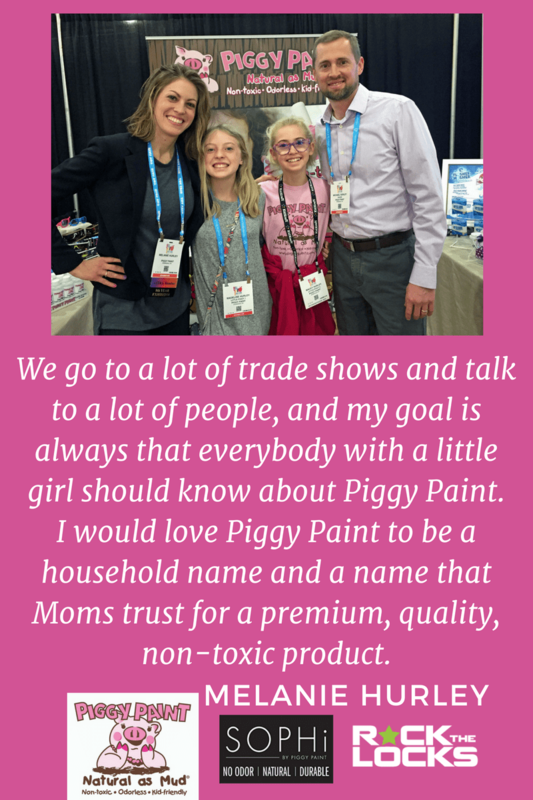 We go to a lot of trade shows and I talk to a lot of people, and my goal is always that everybody with a little girl should know about Piggy Paint. It’s fun, we go to a lot of the same shows so we’re pretty well known in a lot of markets but it’s always fun to go to a new market and meet people and tell them about Piggy Paint. I just would love it to be household name and a name that Moms trust for a premium, quality, non-toxic product. And also to grow our other 2 brands that are new. It’s always fun to take something off the ground and figure out how in the world…. You know you’ve got this great product but letting people know about it is such a great challenge so that’s what I’m working on right now. Because I’ve known so many people that you meet at trade shows, they’re Mompreneurs, Dadpreneurs, just entrepreneurs and they have this great product and sometimes it works and sometimes it doesn’t. It’s just a challenge to be able to bring it to market and make it accessible and people to know about it. It’s always heartbreaking whenever you see people not come back the next year or go out of business. So I feel very blessed. I’ve seen that so many times, I don’t take anything for granted and I know that everything that I’ve accomplished is a blessing. Every small accomplishment is a huge blessing. You know, how my brain works, I’m always onto the next thing, I don’t really dwell on anything. I know I’ve had a lot of things happen but it seems like I’m always excited about what’s happening at the moment, then I’m moving onto the next one. Somebody asked me the other day, what is your favorite thing to do with your girls? I was like, everything I do with them is my favorite, I always have new favorites. I don’t know how to answer that because I get so excited about everything, every accomplishment I feel is my biggest accomplishment. Whether it’s getting into Walmart or getting into Target or breaking into the Natural market or having a celebrity use our product without us sending it to them. Every time something happens I think, Aah, this is it! Out of all those things, do any stand out for you? Was there a celebrity who used your product that you were particularly excited about? Tori Spelling asked me to come to her daughter’s birthday party to paint nails, and I’ve been twice now, to both of her girls’ parties and that was a lot of fun. Kim Kardashian put us in a Snapchat recently. I’m highly excitable about everything. My husband’s like, you get excited about everything, what’re the chances of this happening. I’m like, I don’t know, I don’t know, but it feels exciting. So there isn’t some Mom Inventors or Mompreneur Award you were going for? Yeah, we’ve had a lot of Awards and they are all rewarding, so I don’t know that one is better than the other. Were you invited on any Talk shows? I’ve been on local TV, I was on WGN and went to Chicago but I get very nervous in front of cameras so I try to avoid those. I do better written. I can handle over the phone, I’m not nervous today. But I used to be a Teacher so you put me in front of kids… you know, talk about something that’s an accomplishment… I love going to schools and teaching them about being an entrepreneur and encouraging them and sharing my story and teaching them that they can be entrepreneurs at their age too. Now that’s something I can be proud of and I’m always comfortable around kids. That’s my other passion. But put me in front of adults and I get all squirmy. So that’s a wonderful thing for you… that’s your calling, to be in front of kids as a teacher. It is, it is, I love to go to schools. There has been so many times when it’s been crazy at work and I definitely should not leave the office to go to a school, but I never turn down an opportunity to talk to kids. You must be so inspiring. Can you imagine if someone comes up to you in 10, 15, 20 years’ time and tells you about the successful business they created because of you, because of that talk at school when they were a child? That would be huge. That’s what I would tell you about if you asked me that question again. Yeah, it’s going to happen. That will happen to you and that will be amazing. Shoo, I get goosebumps just thinking about it. What you could do for someone who maybe never had the belief before that they could do that with their lives. What has been the greatest challenge for you to overcome in your career? Is it the balance thing? I think the balance thing is definitely the biggest challenge. And I think learning… you know, being a small business you don’t have people to turn to and ask questions. You kind of just have to figure it all out on your own and google is a wonderful tool. But I always enjoy a challenge, it’s not something I get scared about or nervous about, I take it head on, but it is challenging because there’s always unchartered territory. Sometimes I have people at our office who will come in and ask me questions, and I’m like, wow, that is something I’ve never been asked before, we’ve never had to do, let me think about it for just a minute and then… so that’s a bit of a challenge in itself. I don’t know. I just think that every time my kids do something kind and selfless, that’s really the highlight and that’s when I know I’m doing a good job. Sometimes I think, should I be doing this, my children are just getting to the age where they are such complex wonderful beings but I know I’m doing the right thing. You need that assurance to keep going. Would you like them both to become entrepreneurs themselves? Is that what you’re encouraging them to do? I want them to do whatever they are passionate about. My 13-year-old has actually… I don’t know how many businesses she’s had. She’s handmade bracelets, bath bombs, body scrubs… she’s had so many different businesses. She’s always making a huge mess at home. I always just have to take a deep breath and go, ok, she’s just being creative, she’s taking initiative. Let her make a huge mess. And she did a great job selling them. I had to tell her, you know, you’re scaling up now, you can’t just come home and make 10 a day. You need to project how many you’re going to sell this week so we don’t have a mess every single night. Oh, amazing, that is so cool though. So you have another entrepreneur in the house. Yeah, and the other one likes to cook so we think she might be our Baker. I love being passionate about what I do. I love having that opportunity to be passionate and to make my own rules and to be able to make a difference on my own terms. And the flexibility, there’s a lot of things I like about being a Mompreneur. I don’t think I could go back and do a conventional job, it would be very difficult. How long were you teaching? I only taught 3 years and then I stayed at home for 2 or 3 years before starting this and this is what I’ve been doing the last 9 years. You’re never going to need to back, I would assume – your businesses are doing well. Yeah, they are, but you never know, you never know. I do miss teaching, that’s something… I know I was called to teaching when I was 18. I really felt God was saying, “You need to teach”. And in the 3 years I taught, I still have kids that I’m taking care of, that are 21 now, they were 7 at the time. We’ve even had one live with us so I know that I was called to teaching and it is something I miss, but I teach at Church on Wednesday nights and like I said, I go talk to schools so it kind of fulfils that void that I really had for a while of not teaching. Plus my kids are at that age that I always have lots of kids at my house, so I get to be a Teacher on a daily basis anyway. That’s cool. And you work from an office, not from home, right? How far is your office from home? It’s about 15-20 minutes from home. It’s really just what was available. We just bought a larger warehouse and it was hard to find a lot of options with the size we needed. So your warehouse is big? It’s about 13,000 square feet (1,200 square meters). Nail polish doesn’t take a lot of room, so we’re very lucky that we can fit a lot into not a huge space. Are you selling worldwide? We are. Are your products made in China or the States? We are all in the US. We do have some accessories that come from South Korea but 99% of what we sell is made in the USA. Wow, that is so unusual. Most of the people I’ve spoken to so far has tried to make products in their own country but landed up having them manufactured in China. Yes, it’s challenging. There’s a big movement in the US to stick with products made in the US. No distributors in South Africa or Australia yet? Not yet. Talk about a goal, that’s another goal. Those are two more places I’d like to be. Has it been harder balancing work and home life since you moved to your office or was it harder when you were working from home? (Laughs) Well, I really wanted to keep my kids home with me when I started so it was definitely harder at that time. I still use my same desk because it has so many memories. My youngest would sit up here right beside me, brush my hair, talk to me all day while I’m working and taking calls. Sometimes I had to go hide in the bathroom for a little bit just to take an important call. But at that time we were mainly selling to boutiques and individuals and they were used to my girls singing in the background and squealing and laughing. It was very chaotic but they are sweet memories. It’s nice to be able to keep it separate, that helps me to be able to find that balance, to be able to leave it at the office. I used to take my laptop home all the time and I have to make a conscious effort not to. Okay, I still have my phone with email, but I try not to bring my laptop very often so I don’t get too deep into anything, when I go home I’m just going to be with my family and that’s it. So how long is your working day? It’s pretty flexible. Last year my kids were on the bus by 7, so I started then, but this year my oldest gets on at 8 this year so I come in then. I really try to work a normal work day and sometimes there are things that come up in-between, but I take off for all my kids’ activities at school and I go help at school, so that’s where I enjoy the flexibility. I’m not really a routine person so no, not at all. Do you feel you are living your passion? YES. I don’t think so… I think experience brings wisdom. I feel like I’m a lot smarter than I was 9 years ago so I think things can only get better. I live every day to the fullest so no regrets. 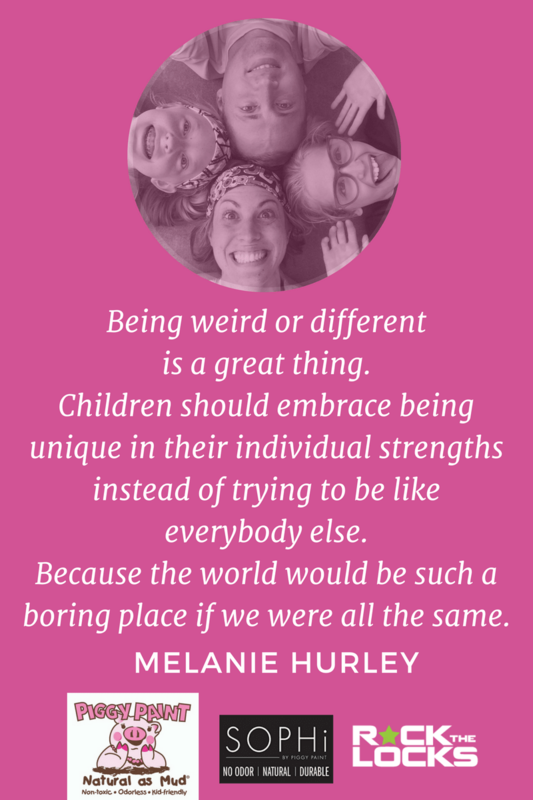 Something I always tell the kids at schools, that being weird or different is a great thing and they should embrace being unique in their individual strengths instead of trying to be like everybody else. Because the world would be such a boring place if we were all the same. So that’s my message that I preach to my children and I tell my kids at school because growing up I was always that weird kid and I wasn’t really sure where I fit in. Now I look back and I see that all those things I was insecure about they’ve really been the attributes that have made me successful today. I wish kids would just embrace who they are and find their strengths and do something with them. That’s how I feel. That’s my message. Wow, that’s a beautiful message. I love that. (Laughing) No. I can’t remember any of the books or songs or movies or words or titles. My brain just doesn’t function that way. I don’t watch a lot of TV or anything but when I’m watching a movie with my husband, “I’ll say, haven’t I watched this”? And about an hour in, I’ll go, “Oh, I have watched this”. Just seek advice from people who have been there before. I had so many people that took the time to help me and I always take the time to help other people too. If you just ask, for the most part, people are kind and willing to help out. So you might as well not make somebody else’s mistake. Is there anything you know now, that you wish you knew when you started out as an entrepreneur? Were there any mistakes you made along the way that you could have avoided perhaps? Well, there are a ton of mistakes but I think all of the mistakes have brought me to the place I am now so I really wouldn’t change a thing. As messed up as things have been in a lot of different places. Life is short, so while we are here it is important to make a difference. It may be impossible to change the world, but making a difference in one person’s life may very well change their world—and the generations that follow them. I’ve learned that I need to use my success as a platform for good. Don’t be afraid to ask successful people questions. Don’t reinvent the wheel when methods have been proven. You can’t be discouraged when people tell you no. At our last show, the guy in the booth across me watched me approach every potential customer that walked by. After the first day he said, “You’ve got balls. I don’t know how you handle getting rejected so much”. Yep, his exact words. I don’t miss telling anyone about Piggy Paint. I get ignored a lot, but we often gain new customers that would have otherwise walked by, not knowing what they were missing out on. Bold isn’t easy, but necessary. Have there been any desperate times when you’ve had no money to continue? Yeah. I got to that when we were growing so fast initially and it came to the point of finding a partner or I was kind of at the point of not knowing what to do. And I found a great business partner to relieve the burden so that was a good decision. Is your husband in the business with you or is he still a Park Ranger? No, he’s still a park ranger. (Laughs) I had just turned 21 so I was blindsided by everything. I wish I had babysat a bit more little ones. I always babysat older kids. But no, you just figure it out, you learn as you go. I wish I could go back and tell myself with babies, hey, just chill out a little bit, they’re going to grow up and everything’s going to be great, so just relax. I was lucky my Dad actually said that to me. He said, “it all works out in the end. Don’t worry about it. Everything works out and they grow up to be amazing. It’s all going to be fine”. Yeah, I feel like I have a lot of strengths I didn’t realize I had. That’s always fun. That’s a nice way of putting it. Do you feel you chose an easy path or a difficult one? Ha ha, it depends what day it is. It’s definitely been a difficult path with a lot of breaks along the way. It depends what day it is, for sure. Other entrepreneurs, other Mompreneurs have been the most helpful. Those personal relationships have been most helpful. A lot of us have grown together and we’ve been able to help each other along the way. I have been to so many tradeshows in the past 5 years and tend see the same people again and again. We’ve become fast friends because we all share the same entrepreneurial spirit (and I think we’re all a bit crazy). It’s always fun to meet people when they are launching their “baby”, an idea they have devoted themselves to. The best times are to watch those companies grow year after year. The disappointing moments are when those companies fold and don’t make it back the following year. Is there anyone, in particular, you’d like to mention? Jon and Melanie Martin. When I turned 14, I started working for them. At that time, they owned a restaurant and large gift shop. They had high expectations for a 14-year-old, and instilled in me the importance of hard work. I worked for them in different capacities through high school and during Holiday/summer breaks in college. They’ve owned several successful businesses throughout the years. My experiences working for them and their guidance gave me the confidence and knowledge to launch Piggy Paint. I gained an understanding of how specialty retailers operate and went in with an attitude of wanting to take care of the stores that stocked our products. My Dad was a banker and my Mom was a nurse. 3. I lived in a small town in a “bubble”. Starting a business was never anything I aspired to. I created Piggy Paint as a hobby while I was at home with my girls. I only told a couple close friends for fear it would fail. Once I got going though, I realized that being an entrepreneur was in my blood and discovered talents I never knew I possessed. No. I don’t think I’ve ever taken a business course. I don’t think that I could sit long enough for a course. And you haven’t done any online courses, any online marketing courses or social media courses for example? We’ve had different employees that have handled the social media for us and they do a lot of those courses and I pop in and out and they tell me the highlights. They have been useful to our company for sure. We do a lot in-house and we also have a third party for website design and graphics so it’s a nice mix. In the beginning, I didn’t have much capital for marketing, so I sent Mommy bloggers samples of Piggy Paint to try on their daughters. They would use it and blog about their experience. 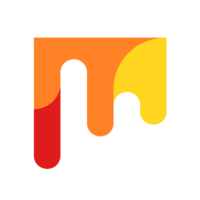 Social media and word of mouth is how Piggy Paint spread. Consumers wanted it and would tell their local stores they should sell it, and those stores would call to order. What do you consider your most valuable asset – that special something that enabled you to make it? It’s still on my desk and I live by it. I am a fighter and don’t give up on what I believe in. I have failed numerous times, but haven’t let it define me. I get back up and figure out a different avenue to succeed. Girls age 2 to 10 is really our sweet spot, but we do go as young as babies. Not just girls, we have a lot of boys who use the nail polish too. Moms with young kids who are seeking natural products for their family. Distributors who market to Toy Shops, Baby Shops, Gift Stores, Pharmacies, Salons, we hit a lot of different markets. 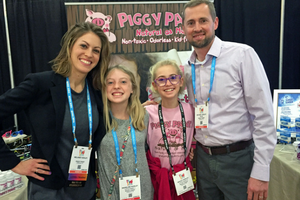 Piggy Paint is now in over 5000 stores and sold internationally. Many Thanks to Casey Bunn of Handsocks for introducing me to Melanie. Wonderful interview of such a great, positive, strong woman! 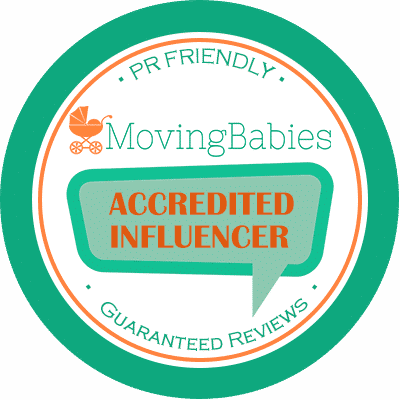 Thank you so much for your website and for helping other Moms get to where they want to be in life. I can relate to a lot of what she said, one of the main things I always told my daughter and still do, is be yourself, no matter what that is. If you fit in you do, if you don’t, you don’t. You are the smartest, most beautiful, most loved little girl in the world and you can do whatever you want. I look forward to reading more of your incredible posts! Thanks for your awesome comment, Keli. I love love love what you say to your daughter. Stunning. 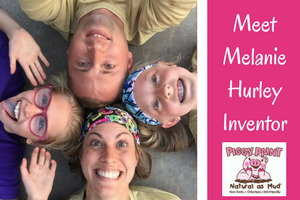 Thanks for sharing this, an awesome post showing the real side of running a business while raising a family. Some of these points really resonated with me, it’s so important to balance family and work life, time passes so quickly! The Piggy Paint is such an obvious need! What a thoughtful, wonderful product. I bet it doesn’t smell as toxic as normal nail polish. I’m going to show my daughter this (she’s 10, going on 18!). What an inspiring person! (oh, ha ha I just looked at the name of your website.) SO incredible that she runs three companies and is still down to earth. There are some great tips shared in there. Thanks for sharing and looking forward to reading more.